South Africa's favourite grey water recycling system. 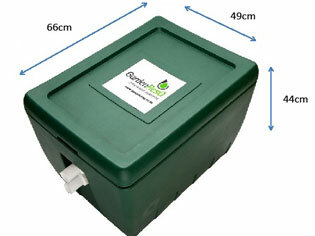 Save water by irrigating your garden with your waste water. IS THE PRICE OF WATER RESTRICTING THE GREENING OF YOUR GARDEN? Grey Water Systems (Graywater) and other waste water recycling products are not a new phenomenon and have been in use in the United States and Australia for many years for garden and landscape irrigation. By reusing grey water (gray water) in a responsible manner, the demand for potable (drinking) water can be reduced dramatically. This ties in with the South African government and their demand for a drastic reduction in fresh water usage and thus water savings. Grey water utilisation is one method government recommends to create massive water savings in the home. It is estimated that up to 50% of all household potable water is used for garden irrigation purposes. At Garden ResQ Greywater Systems, our aim is to assist you in saving water in your home as well as providing safe recycled grey water for your garden with a cost effective DIY system. By recycling grey water from your bathroom, you not only save water that is still relatively clean, but also assist local and national government in their Water Demand Management projects and initiatives. An added bonus is that you are able to irrigate your garden in times of drought and water restrictions and low rainfall. Garden ResQ is the favoured supplier of grey water reuse systems of The Financial Mail and is proud to be involved with the current water saving drive with our grey water system. This drive reduces the wastage of water and thereby helps save a valuable resource – potable drinking water. This initiative has far reaching implications and could, with the correct emphasis, be one of the most dramatic mechanisms that offer us all a bit more time. Is climate change real? Whatever our views is it not time to consider the 3 R’s: Reduce, Reuse and Recycle. Once we implement a recycling program, we are well on our way to an eco-friendly and sustainable lifestyle. Read more about our experience and background in the manufacture, marketing and sales of the award winning Garden ResQ Grey Water Systems. You must be Aenean eu leo quam. Pellentesque ornare sem lacinia quam venenatis vestibulum. Etiam porta sem malesuada magna mollis euismod.